180 pages | 14 B/W Illus. 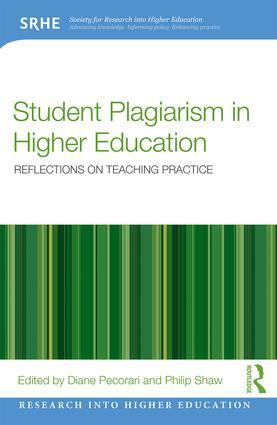 Student Plagiarism in Higher Education is a crucial read for any university teacher concerned about plagiarism. It provides the tools and information needed to assess this often complex international phenomenon constructively and effectively from a variety of angles, and provides a framework for further discussion and research. collates the thinking of international leading experts on the topic of plagiarism from different areas of the academy. Student Plagiarism in Higher Education provides an excellent insight which thoroughly interrogates all aspects of the plagiarism argument. Theoretically based and carefully considered contributions from international experts ensure that this volume is an invaluable asset to anyone wishing to read more, learn more and think more about plagiarism. Why so many questions about plagiarism? Mary Davis and John Morley. Is student plagiarism still a serious problem in universities today? Why does plagiarism detection software not find all plagiarism? Can we use plagiarism detection services responsibly? How does intertextuality inform plagiarism? Shouldn't our expectations of students' and academics' intertextuality practices differ? Are we making our students plagiarize? Diane Pecorari is Professor of English at City University of Hong Kong and Linnaeus University in Sweden. Philip Shaw is Professor Emeritus at Stockholm University and Senior Professor at Linnaeus University.